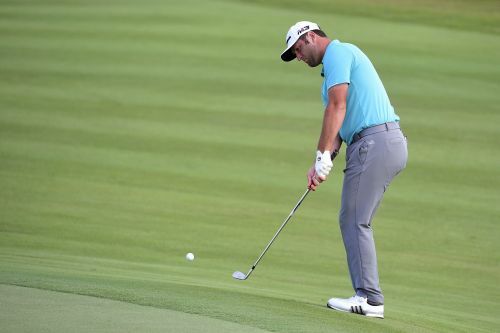 NASSAU, Bahamas (AP) — In his first trip to the Hero World Challenge, it didn't take Jon Rahm long to figure out how to score. Being aggressive starts with keeping the ball in play. And with five par 5s and a pair of reachable par 4s at Albany Golf Club, plenty of birdies should be available. That was the case Friday, when Rahm made birdies on half of his holes for a 9-under 63 to share the lead with Henrik Stenson, who had a 66. "I hit it so solid off the tee, I was always in the fairway with a short club in," Rahm said. "I think the best way to describe it, having five par 5s and two relatively short par 4s, out of those seven holes I got six birdies. So I capitalized on the easier holes today. Didn't seem like much could go wrong." Only the end went wrong for tournament host Tiger Woods, and it could have been worse. Woods was 5 under for his round and trying to stay in the thick of his holiday event when he drove into a palm bush on the 18th hole. He dropped to one knee to pop the ball back to the grass, came up just short of the green, chipped weakly and made double bogey for a 69. But questions arose about this shot out of the bush. After extensive video review, it was determined he hit the ball more than once. However, because of an 18-month-old rules decision that limits the use of video evidence, Woods was spared the additional penalty because he didn't think he made contact twice and it couldn't be determined by the naked eye, only the use of high resolution TV played in super slow motion. "Looking at in the regular speed on a high definition television, you couldn't tell that at all," said Mark Russell, the PGA Tour's vice president of rules and competition. "But when slowed it down to ultra-slow motion, high definition television, you could see where the club did stay on the clubface quite a bit of time, and it looked like he might have hit it twice. But there's no way he could tell that." Even so, Woods remained eight shots behind in his first 72-hole event since ending his remarkable comeback year with a victory in the Tour Championship. He was tied for 14th, along with Patrick Reed, who shot 40 on the front nine on his way to a 77. Patrick Cantlay, who shared the 18-hole lead with Reed, had a 70 and was one shot out of the lead along with Dustin Johnson, who had a 67 in a tropical spot where he loves to vacation but rarely contends. Johnson had a pair of sloppy bogeys early on the nine — one didn't bother him too much when 3-year-old son Tatum came out to greet him — and recovered nicely on the back nine with four straight birdies to get in the mix. Tony Finau had a 64 and was two shots behind. Stenson nearly rallied from a seven-shot deficit in 2016, only to finish toward the bottom of the pack last year. He has had enough rest for the tendon in his left elbow to quit bothering him on the golf course, and he gets another crack at winning this weekend. "I'll try and make it to the finish line," Stenson said. "I haven't played a lot of golf, though. Since the Ryder Cup, I had an injury problem, I was out for five weeks. So I guess I should be a little bit fresher than some of my colleagues who call me from Hong Kong or somewhere else at this point. I'm feeling all right. We just keep on going, try to make as many birdies as we can." Everyone was under par going into the weekend, with Jason Day bringing up the rear at 1-under 143. It's a testament to the good scoring conditions, with all but two players under par in the second round — Reed and Bubba Watson, who had a 73. Woods was hopeful of much better considering how he struck the ball, though he missed plenty of chances. "I didn't really figure out my putter well today, missed quite a few short ones," Woods said. "I hit the ball close — close enough to really have a shot of a low number today — just didn't do it." Rahm figured out the secret to that. He hit it so well off the tee but he had no choice but to stay aggressive and attack flags, and there's no reason to stop now in his final event of the year with five players separated by just two shots. "On days like today, I just didn't really think about my swing," he said. "It was like a well-oiled machine."